I’ve spent the last 20 years of my life reaching towards the dream I’m living today. Seriously. I’m living my dream life. Today. How many get to say that? I didn’t always know EXACTLY what the dream would look like. At first, it started out as a simple phrase, “I want to take pictures like that.” And from there it grew. It changed. It took side trips. Sometimes it got fuzzy. Once I said I was going to quit. But I’ve been on this journey, pointed in this direction, for a long time. And now it’s simply who I am. A traveling photographer who uses her camera to tell cowboy life and love stories…and gets paid good money to do it! A few years back, as I saw myself getting closer to some of my biggest goals, I realized what I once THOUGHT was the “ultimate success” was only a stepping stone to bigger things. I wasn’t sure what. I wasn’t sure how. But I knew there was so much more. Folks have been asking specifically for the “more” for a while. If I had a dollar for every time someone said, “You should….” or “Would you…” or “Can you please…” We could buy us our dream ranch already. And now someday feels close. And before we go further. I’M NOT QUITTING RANCH WEDDING PHOTOGRAPHY! Oh don’t you even think that for a second! It’s been a journey of 20 years to get where I am today and you better believe I’m not done enjoying, savoring and loving every second of this dream. I’ve got soooooo many more love stories to tell before they put me in the ground! BUT. The last 3 years my social media has been pretty one track focused. I knew who my target market was and I leveraged every aspect my social media very intentionally and specifically to reach the exact couples I wanted to work with. IT WORKED. I grew an authentic following, booked in every corner of the country, made priceless connections and built so many friendships…within that very specific niche. And I can’t even put into words how amazing it’s been! So what does the future hold? Why am I writing this? Well, I don’t know the specifics yet. But I know in my heart what GENERAL DIRECTION I’m heading and that I need to get started that way. What I do know. My vision of “success” in this priceless season of life as a mama of two kiddos and a wife to a cowboy pursuing his own dreams…is shifting. Because of that I know it will look like a few less glamorous travel adventures and more of my kids taking rides on Hippy Car the mini horse. I’ll still be sharing those mushy engagement photos…but I’ll also be blogging more than JUST the “love stories.” I’ll be posting my #ranchwedding images and loving on my wedding industry friends. But I’m also going to be connecting some more with fellow-ranch gals and unfollowing a lot of those wedding magazines. I might even talk more about my favorite purse organizer I’ve been getting so many DM’s about. But you can rest assured I’ve said I’ll NEVER be a mommy-blogger. I also said I’d never shoot weddings. Ultimately I’m going to be doing and posting more in response to the “You should…” and “Can you please…” or “When you have time…” things I’ve been hearing for years. And part of that will look like more mentorships. A few workshops. And lotsa blog tutorials. Stuff. More on that SOON! And not just ALL photography related. I’ve said all this because…I want to give you permission to unfollow me. Things are shifting around @LyndseyGarber and while some things will stay the same, other things will change. 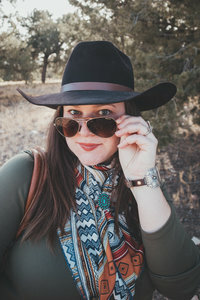 And you (the audience I’ve reached solely pushing towards this dream as successful traveling ranch wedding photographer) might not be genuinely interested in me posting more about Lyndsey Garber the teacher, blogger or kid wrangler. So if you find yourself increasingly uninterested in my posts, realize you are liking my content less and less or are constantly swipe by my stories…I am asking you to please unfollow me (rather than muting…for the sake of Instagram analytics). Because I’d rather have only 500 followers that love on everything I post than 10,000 who just aren’t feeling it. If you are going to unfollow, I gotta say this before you go: THANK YOU for being with me during this season! Now go follow and love on another deserving account that really tickles your fancy. But feel free to swing back by and say hi anytime! Lastly. If you found me in the last 3-ish years of my traveling-ranch-wedding-photography adventures and you are choosing to stick around. Thanks guys! Regardless of what I post, what stage of life I am in, or who I’m talking to…I always hope that my life and posts will brighten your day!